An article by Ben Steverman (Bloomberg News) from Sunday’s LA Times dealt with some tax-related issues that are going to affect a lot of divorced couples and their respective families. It’s an extremely informative piece that’s well worth the read. I wanted to highlight a few things he brings up that are directly related to why people, in the right sort of circumstance, are turning to alternative ways of dealing with divorce issues to avoid going to court. The changes end the deduction for alimony and open new avenue to court challenges. Prenups often contain provisions about how much a partner would pay in alimony, also known as spousal support. The agreements can be thrown out if judges deem them unfair, or signed too quickly or under duress. Now the tax revamp offers another avenue for challenges because courts probably will have to consider how the law has changed since the contracts were created. Starting in 2019, payers no longer will be able to deduct their alimony payments. For divorcees in the top tax bracket, the change could mean they, in effect, pay double in post-tax costs compared with what they agreed to in their Prenups. It’s fair to say that Prenups have become more popular in recent years as younger Americans delay marriage, and the divorce rate has skyrocketed for people over 50, who often use Prenups if they remarry. More than 60% of divorce attorneys said they had seen a rise in the number of clients seeking Prenups in the previous three years, while just 1% reported a drop, according to a 2016 survey by the American Academy of Matrimonial Lawyers. If agreements aren’t amended to factor in the tax changes, it will be up to divorce attorneys to settle — or judges to decide— whether the amounts or formulas still stand for couples who divorce starting next year. Even if both parties agree to an adjustment in alimony, they’ll need to agree on exactly how much to cut the payers’ obligations. Divorcing couples could end up hiring rival accountants as expert witnesses to sway judges. Ultimately, the change could hurt alimony recipients. Payers could plead with judges to revise their obligations given the new law — a valid legal argument given that many Prenups specifically mention that the payments are intended to be deductible. 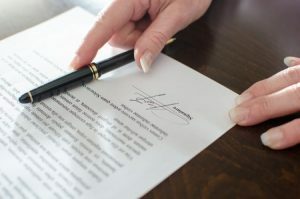 Divorce attorneys already have been warning that killing the alimony deduction could make splitting up more acrimonious. It’s wedding season. Time for a prenup? Next Next post: Will “Calendar Crush” Push “Hybrid Settlement”?